My great-grandmother, Martha Ann Conn Keithley, apparently died during or shortly after the birth of her last child, Mabel Amy Keithley. I say apparently because we’ve not yet been able to locate any documentation concerning her birth, parents, young years, or death. Attempts to gather information by way of learning about her last child have also been fruitless searches and particularly difficult because the stories told by Mabel’s children contain a good bit of variability. Death of a parent is always traumatic, but in earlier times, the death of a mother would have been particularly difficult for a family because, with the lack of available daycare options, a father with small children would have been unable to carry out the daily work necessary to provide for the family. As best as we have been able to recreate the story, Joseph Keithley placed three of his children (Violet, 8; Eva, 6; and Leo 5) with family members, but the infant, Mabel, was placed in a non-family situation. What we had been able to glean from the stories of Mabel’s children was that she was possibly born in Girard, Crawford, Kansas, on or about July 29, 1889, given away to a family that then moved away and, at some point, ended up in Wisconsin. The 1900 census for the Keithley family had them living in Carterville, Jasper, Missouri. When we found a death certificate for Mabel’s daughter Grace, the place of birth for mother was listed as Joplin, Missouri, which is also in Jasper County; consequently, potential birth locations for Mabel were, like everything else, full of variables. One of the stories mentioned to me that illustrates the sense of aloneness she felt was of Mabel as a young girl being at a hotel and being taken in and cared for by strangers. Generally speaking, the stories recounted by her children were of a woman who was deeply hurt as well as angry that she had been given away and that she had been raised with no sense of home or family. According to her children, Mabel used various surnames during her younger years, the one they could remember was Sanden but, by 1907 when she married in Wausau, Marathon, Wisconsin, she was using her birth surname of Keithley. According to her daughter, Arlene, Mabel had been contacted when she was 16 by her father, who had apparently begun to search for her because of an inheritance left to her by an unnamed (to us) Keithley; this would have been about a year before her marriage. Although she apparently chose to not connect with her father, she presumably took back the name of Keithley since she used it on her marriage certificate and identified her mother as Martha Ann Poren (perhaps an attempt to decipher handwriting because the name was Martha Ann Conn). Our major clue by which to search for Mabel was the last name of Sanden and the location of Marathon County, Wisconsin where she was married. No search ever came up with a connection between Mabel and Sanden or Mabel Keithley, whether in Missouri, or Kansas, or Wisconsin. I have searched for Mabel any number of times and with any number of other key words but never had a hit that went anywhere – until this weekend. I searched for Mabel with a birth date range of 1887 to 1892 and limiting the search to Marathon County, Wisconsin. There were several Mabels listed but there was one that was listed as being born in July 1889 in Missouri. The record was the 1900 census for Henry and Sarah Whipple and an adopted daughter, Mabel – all these items would have fit our Mabel: Next, I found the 1905 census for Mabel Whippler, still living with Henry, now widowed, this time just listed as daughter: At this point, I was just in hunter/gatherer mode, but on this same 1905 census page, I found something that made me suspect I might truly be onto something. On the same census page was another Whippler family and just below them a family with the last name of Saindon. Saindon might just possibly be the spelling difference we’d been needing to find records matching Mabel Sanden/Sandon. And this Emma Saindon was listed as being born in Missouri, which would possibly place the Whippler family in Missouri where our Mabel was likely born. So it was time to search for earlier Whippler records to discover the names of his children if Emma was, in fact, related to Henry Whippler. Sure enough, there was Emma (though she was actually born in New York). The 1880 census placed the family in Missouri, but a little over thirty miles to the southeast of Carterville. Even though Emma was not born in Missouri, she lived there by the time she was three, so I had now placed the Whippler family in Missouri, although not as neighbors to whom one might give a daughter. Due to that dratted fire that destroyed the 1890 census, I have been unable to actually place Mabel living with the Saindons or find any other record until the 1895 Wausau, Wisconsin census for Henry Whipper, which was a tic mark census showing a family with one male and two females. This was, although creating mounting eagerness in me to discover more, still only supposition on my part. The only records we had previously had for Mabel began with her 1907 marriage to John Stevens Tomany in Wausau, Marathon, Wisconsin. What I now had for Mabel Whipple is a potential paper trail with clues to Missouri, clues to Sanden/Sandon/Saindon, and clues to Wausau, Wisconsin. Then I found a Wausau City Directory online and found addresses for 1910 for John and Mabel of 2340 6th Avenue, and for Henry Whipple of 514 Union Street. 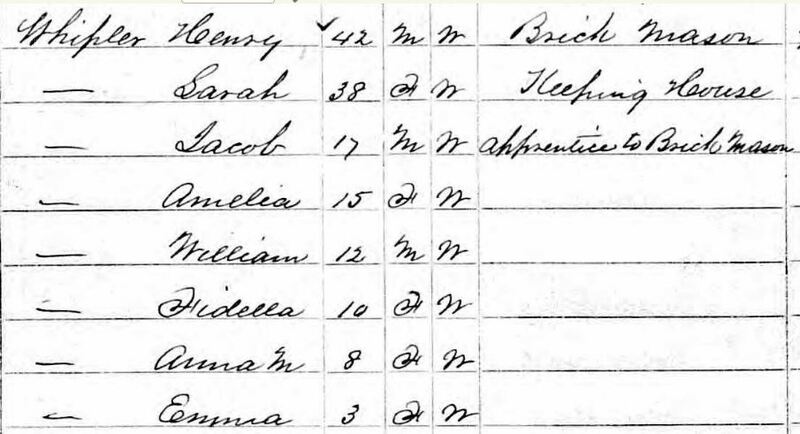 The 1900 census for Henry was 517 Union Street, but John was not living in Wausau during the 1900 census, so I had no possible crossing of paths for them as yet. I input those two 1910 addresses into Google maps and discovered something quite revealing. Here is the map area of these two locations: They could have almost seen one another’s house – just about a block apart. Coincidence? Probably not. In noting the ages of Henry Whippler (81) and Sarah J. (67) in the 1900 census, it it highly probable that a young child would have, at times, been a strain for them to handle and that the other Whippler children often cared for Mabel, which certainly could have left her never knowing exactly where she fit in. Mabel’s daughter Arlene said her mother never had a consistent home until she was about 10. Sarah Whippler died in 1901 (FindAGrave memorial information) and it is likely Mabel was in a more consistent home environment when she was about 10 due to the need for a more available live-in helper; she was still living with Henry in the 1905 census when he was 86, and presumably until her marriage in 1907. As I continued to look for Whippler records, I found a WWI draft registration for Harry Elmore Whippler who was born in 1891 in Carterville, Jasper, Missouri, which is where Mabel’s family lived in 1900 and probably at the time of her birth. Obviously, with a connection to Carterville, I had to check to see if this Whippler family had a connection to Henry and Sarah. A search for the 1900 census for Harry showed they did. Harry’s father was Jacob Whippler, eldest son of Henry and Sarah; thus, I have placed this Henry and Sarah Whippler with connections to the birth of their grandson, Harry, in 1891 to the home of the Keithley family. There are still many questions to be answered: was Mabel actually adopted and might there be adoption records available? Such adoption records might give us a better idea of the time of death of Martha and, in fact, some details regarding the birth parents as well as the specific couple that took her. All of us who are desperately seeking Mabel would love to hear from anyone for whom these clues may trigger another clue that might lead us to her birth location, the death date and place of her mother, the families she lived with or any other bit related to her life. Today, July 1, 2013, is the 219th anniversary of the marriage of my 5th great-grandparents, William Berry Blackstock, Jr. and Mary ‘Polly’ Bobo. According to the U. S. and International Marriage Records, 1560-1900, they were married July 1, 1794. 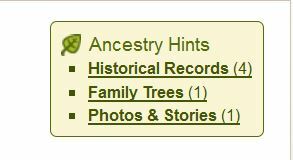 I don’t know about you, but I find it amazing that we can find any records at all about people who lived more than 200 years ago. This country is relatively young and many of our earliest settlers couldn’t read or write and yet, those who could, recorded momentous occasions – births, deaths and marriages in family Bibles, and land transactions, probate documents, civil and criminal documents at courthouses – and so, we sometimes find documents from which we can discover and/or infer bits and pieces of their lives. The Blackstocks owned a plantation in Union County, South Carolina, which I learned was a Revolutionary War battle site called the Battle of Blackstock’s Plantation. My daughter and I made a research trip to South Carolina in June 2012. The specific dates for the trip were planned around a family reunion held by some Miles descendants – I have no direct line Miles ancestors – just that my great-great-grandmother’s sister, Mary Foster, married a Miles and then my great-grandfather’s half-brother’s widow, Mary Priscilla Middleton Willis, married the same Miles man after they both were widowed in the early 1860s – additionally, the elder Miles was a local minister who had married several of my extended family members. The reunion planners had scheduled several speakers and visits that tied directly into our research wants and needs and made joining them a great benefit. One of the scheduled activities was a visit to the Blackstock Plantation with a speaker from the South Carolina Parks, Recreation and Tourism department who currently own the land. 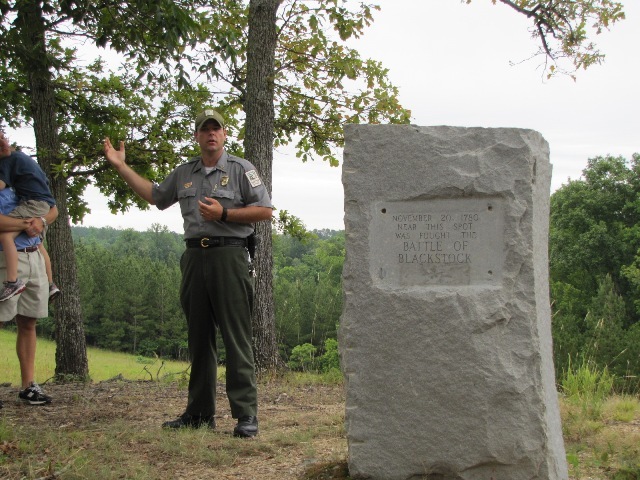 The park ranger, who came out on a Sunday morning, talked to us about the family and the battle and the impact on the ultimate outcome on the Revolution. There are a number of websites with information on this Battle; I have provided one link for anyone with an interest. One of the stories I heard from the ranger that day and have also seen written was the account that Mrs. Blackstock (apparently the younger because there were several small children around her and the older Mrs. Blackstock was past childbearing years), was out in the field telling Banastre Tarlton that she forbade him to fight on her property. Her husband, William the younger, was serving with Col. Roebuck’s unit and was away at the time of the Battle. We can infer from that story as well as William’s age of 30 that he had been married before he married Mary “Polly” Bobo since the battle took place in 1780 and they didn’t marry until 1794. There are some family trees that list his wife’s maiden name as Yarbrough. Since other Blackstock siblings married into the Yarbrough family, it is not unreasonable to assume that his first wife was, in fact, Mary Yarbrough; to date, I have not found supportive documentation. My daughter got DNA samples from my son and grandson for autosomal testing through Ancestry.com. We have had several matches that would appear to have come through the Bobo line and, thus far, this is the only direct line Bobo I’ve found. A slight digression would be to say my daddy bought a marvelous blonde Cocker Spaniel puppy for us in 1955 or 1956 that he named Bobo. At the time it merely seemed like a reasonable name for a pet but once I started doing research on daddy’s family in Fayette County, Alabama I discovered many of his neighbors’ surnames were Bobo and though there were some marriages between aunts, uncles or cousins, there weren’t any Bobos in my direct line. What a pleasant surprise to find that the name Bobo that daddy chose as a pet name was actually a direct line surname by the time I arrived at my 5th great-grandmother. Once the reunion was over, we began the research portion of our trip and headed over to Columbia where the South Carolina Archives are housed. 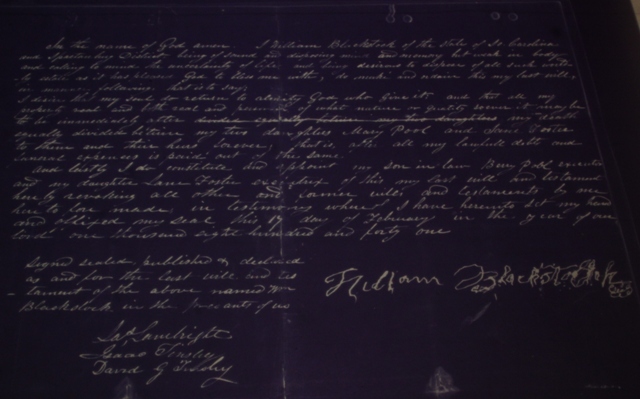 We found William Blackstock’s will. In spite of the fact he apparently had children from his first marriage, he only mentions the two daughters born in his marriage to Mary Bobo. I have been unsuccessful to date in locating information on those earlier children; consequently, it is difficult to know if they were omitted because they predeceased him, or if they had quarreled, or moved away and had not stayed in contact with him. Since the daughters were the only ones mentioned, it is presumed that his wife had predeceased him. Both daughters were married and are identified in the will by their married names: Mary Pool and Jane Foster. George Pool is named Executor and Jane Foster (my 4th great-grandmother) is named Executrix and the property was to be divided equally between the daughters after his debts and funeral expenses were paid. One of the benefits of the will is that my daughter gained another signature for her signature file. The signature tells us two things about him – he could write and his control of his hand was shaky – quite logical since in 1841 he was 91 years old. Information on my Blackstock/Bobo ancestors is spotty and, thus far, not very thoroughly documented. I would love to hear from anyone from either family who could add to my knowledge and documentation base for them.